The catcher who displaced A.J. Pierzynski as the Giants’ starter before the 2005 season became his manager in 2014. Pierzynski, signed by the Cardinals on July 26, 2014, to help compensate for the loss of injured all-star Yadier Molina, was the Giants’ starting catcher in 2004. The Giants were interested in having him return for 2005. Instead, given a chance for a defensive upgrade that better fit their budget, the Giants signed free-agent Mike Matheny in December 2004 and dumped Pierzynski. A decade later, Matheny, 43, was the Cardinals’ manager and Pierzynski, 37, joined Tony Cruz as the St. Louis catchers. The Giants paid a hefty price for Pierzynski when they acquired him from the Twins in November 2003 for pitchers Joe Nathan, Francisco Liriano and Boof Bonser. 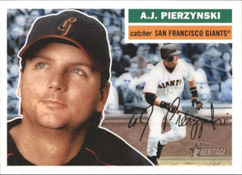 Pierzynski produced a career-best 77 RBI with 28 doubles, 11 home runs and a .272 batting average for the 2004 Giants, but he was criticized by teammates and booed by fans. He caught only 23 percent of runners attempting to steal (15 of 66) and was charged with nine passed balls. After the season, Pierzynski was eligible for arbitration. Because of his hitting, he appeared poised to be awarded a judgment of more than $5 million for 2005. The Giants, unwilling to pay that much for one season, wanted Pierzynski to consider instead a multiyear contract in the $9 million to $10 million range. When Pierzynski suggested a larger amount, the Giants turned to Matheny, a free agent who earned three Gold Glove awards as the Cardinals’ starting catcher from 2000-2004. The Cardinals hoped Matheny would return to continue to mentor Molina in 2005, but were unwilling to offer Matheny more than $4 million for two years, according to the San Francisco Chronicle and the St. Louis Post-Dispatch. When the Giants offered a three-year, $10 million deal, Matheny accepted. Pierzynski requested his release, enabling him to become a free agent. Matheny established the major league record for consecutive errorless games by a catcher (252 games from August 2002 until August 2004). He caught 30 percent (16 of 54) of runners attempting to steal in 2004 nd had just two passed balls. ”There’s no telling how many runs he’s going to save,” Sabean said to the San Jose Mercury News. Several media reports cited Pierzynski’s personality as a factor in his departure. Matheny won his fourth Gold Glove Award with the 2005 Giants. Pierzynski signed with the 2005 White Sox and helped them to their first World Series championship in 88 years.